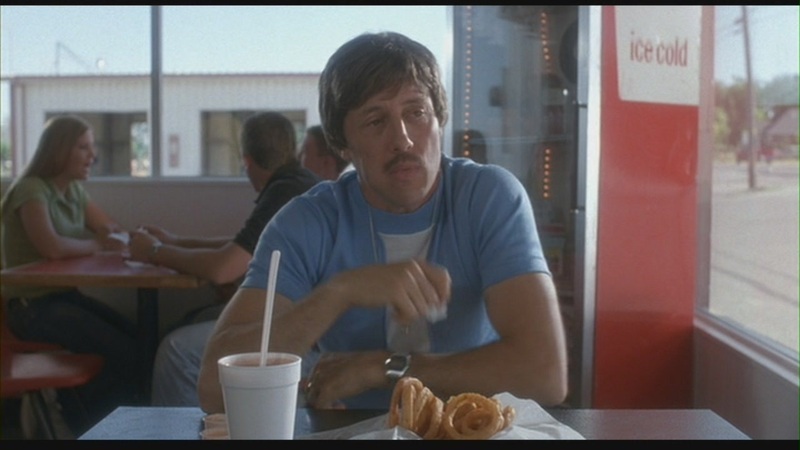 Released in the summer between my junior and senior years of high school, Napoleon Dynamite would pretty much become one of the defining films of that year for my class (and a lot of other people, too, but this is my blog). Along with the first Anchorman and Garden State, seemingly nobody was able to shut up about these three films, all released that same year. Of those three, though, Napoleon Dynamite was the only one that I took to along with everyone else – I didn’t see Anchorman until well after it was released on DVD (and even then, I didn’t care for it much – I was a bit of a prude at the time), and I didn’t see Garden State until after college, when I gave myself the graduation gift of Netflix, because I had gotten quite sick of hearing about how wonderful it was over the next few years (it was… alright). Napoleon Dynamite was seemingly the kind of movie that was either destined to make back a small profit, at best, and then fade into cult classic status or just fail outright and fade away entirely. Instead, for whatever reason, the film defied expectations and became a smash hit with the entire nation, earning the $400,000 film over $46 million and who knows how much in merchandise. 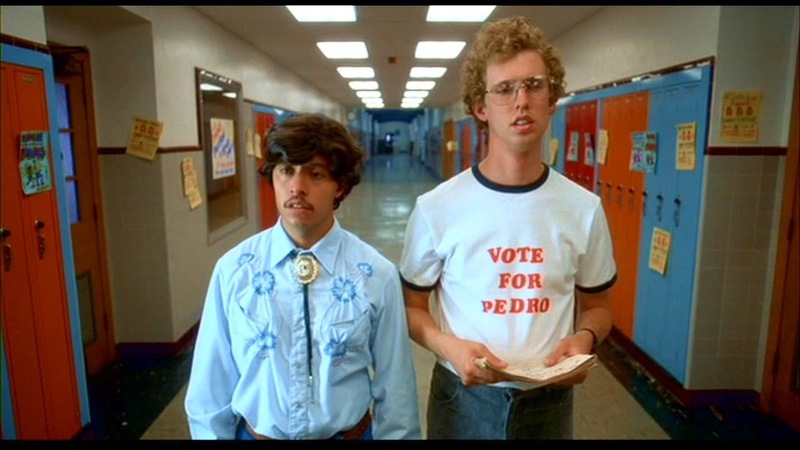 I recall seeing “Vote for Pedro” shirts still on sale in places like JCPenney within the past year, and the movie even spun off into an animated series … which, come to think of it, no one liked… but that’s beside the point – Napoleon Dynamite was big – big enough for marketing departments at Fox to believe that they could coast over the next ten years marking the hell out of this film and turn an easy profit. So, yeah, it’d been a while since I had actually seen the film itself before I decided to do this review, all thanks to a few overzealous fans who were long overdue in finding something else to obsess over (THERE ARE OTHER MOVIES BESIDES THIS AND BRAVEHEART! ), but seeing as how it was the 10th anniversary and all, I figured now was a good time for me to revisit the movie and see if it held up in any sort of way – perhaps, even, to see if my own scars had healed and if I could forgive the movie and accept it back into my life. After all, it’s very unlikely that anyone involved in making the actual movie could have anticipated the hell they would soon unleash upon us through unsuspecting audiences, and it’s just not very Christian of me to hold a grudge like that, either, you know? And, so, into the Netflix queue it went. 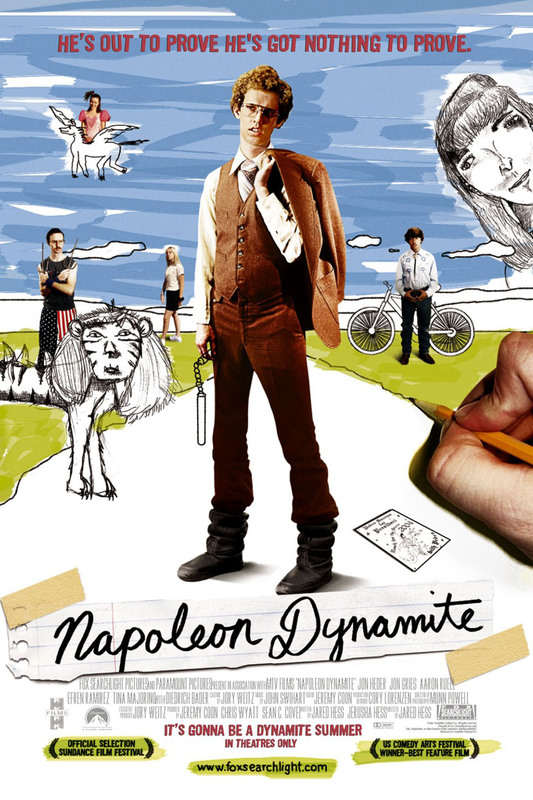 The thing that immediately becomes obvious about Napoleon Dynamite is that it’s almost reminiscent of the kitschy, time-period-ambiguous, eccentric goodness of a Wes Anderson film, but in a sort of lowbrow, generic store brand kind of way. The oddball characters in Wes Anderson films tend to be likeable goofballs who have a disproportionate sense of self-worth that they make readily apparent to the audience and those around them, whether they mean to or not. They’re not often bad characters, but they are characters who are either misunderstood, misguided, and/or too eccentric for their own good and the good of those around them. Often, in order to mend these relationships and better themselves, they need to be humbled, recognize their own limitations as people, and focus on their better qualities. 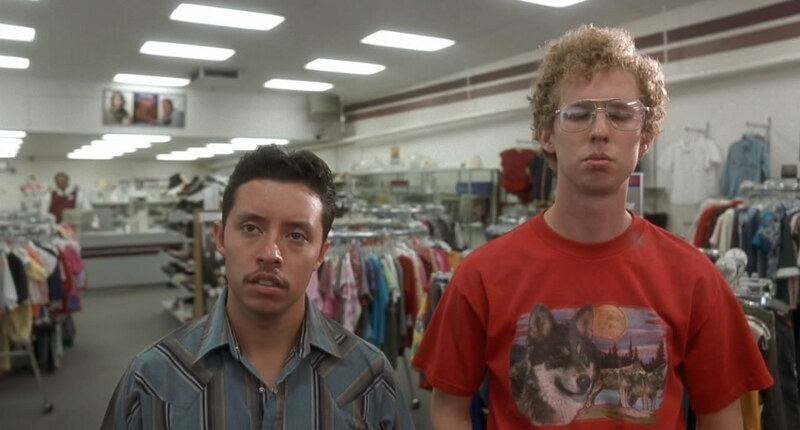 Napoleon Dynamite similarly features highly eccentric characters, many of whom have no real grasp on how other people perceive them, but it does so in a much more upbeat and more surface level sort of way. Napoleon, true to his namesake (I’m talking the Napoleon complex, not the actual French emperor who gave that its name, nor am I talking about Elvis Costello, whose nickname this movie swiped for its own purposes), is a nerdy, gawky teenager who is, naturally, a social outcast, disliked and laughed at by most of his peers, but he sees those who mock him less as bullies and more like lesser people who just don’t get his awesomeness. Perhaps because of this, he’s a bit of a misanthrope, but when he does get around to talking with someone who gives him the time of day, he frequently shifts all attention on himself and tells wild stories about his proficiency with weapons and the ladies, not to mention his access to awesome secret knowledge the rest of the world isn’t privy to. Along those lines, he’s a firm believer in cryptozoology (in that he actually believes this creatures exist), and his interests include obscure animal hybrids, fantasy worlds, and a few …well, odd artistic endeavors. His brother, Kip, seems to be a picture of what’s likely yet to come for Napoleon: living with his family still well into adulthood, chatting with people on the computer all day, and claiming to have a way with the ladies he meets there. Going even deeper into the Dynamite family tree, Uncle Rico shows us just how bad their delusions may become if they don’t move on and stay relatively close to the ground. Grandma seems pretty cool, if a bit unusual, though. One has to wonder about what kind of people Kip and Napoleon’s parents were when they were still around. I would not be surprised if they were zoologists who got eaten by a liger… and little Napoleon respected it for its raw animal instinct and power and thus inspiring his unusual interests. Unlike most of us, these eccentricities do not seem to bother Napoleon. While it may seem like he’s are kind of pathetic by reality’s standards, the movie only goes as far as teasing him – in fact, the movie seems to admire him, more than anything. The same goes for those close to Napoleon, too – except for Uncle Rico, who really is kind of pathetic and in need of some real change in his life. Most of the town seems to operate on the same level of delusions as Uncle Rico, in fact. Their smugness and feelings of superiority towards Napoleon and his friends, Pedro and Deb, make them seem a little more insecure than they let on – the jock who’s too cool for school, the snobby rich girls, Trisha and Summer, who think everyone will like them because they’re pretty and do and say cute things, the befuddled principal who can’t possibly wrap his mind around cultural customs that may not be his own…. Napoleon, Pedro, Deb, and even Kip, despite their strange personalities and inflated perceptions of themselves and their talents, pretty much get rewarded in the end in some manner, and it reserves a little happiness, too, for the other more antagonistic characters, because the movie knows that its scope is small, but its targets are broad, and so even they aren’t necessarily monsters. So, yeah, there’s a lot of subtext going on in the film that never really came through amidst all the years-long hype, at least to me, but that doesn’t necessarily mean that the movie itself is any good. Even bad movies have something to say but can still be boring as heck or completely inept in execution. Most of what I took issue with in the past ten years has been the obsessive repeating of the movie’s jokes, as if repeating same ones over and over again on a fairly regular basis would only make them funnier the seventh time around. Would the magic of the jokes suddenly return and make them funny again after some time apart? Well, I’m honestly glad to say that, yes, the film actually does still hold up in the humor department, and it’s not just that the stale, rundown humor was suddenly revitalized all over again as if exposed to some kind of awesome silica gel packet or something. A lot of the humor to be had isn’t just in the physical humor and amusing lines, either – there’s plenty in the little touches here and there that aren’t nearly as obvious as taking a bike seat to the groin or a milk-inspired compliment about someone’s weight. There are little touches here and there that add to moments that I have no idea if they are intentionally done that way or just accepted in spite of their accidental appearance – things such as the little glistening spider web strand that’s caught in a draft and tethered by Napoleon’s puffy hair just before he botches a jump and receives the aforementioned seat to the groin, or the errant fly that keeps buzzing around a character’s head when getting his portrait done, or the hilariously mumbled line reading of an old farmer talking about something just off camera. I’m sure this information lies somewhere within a commentary or something, but, either way, extemporaneous or planned, their inclusion is a testament to Hess and his crew’s attention to the film’s atmosphere. A lot of credit also belongs to Jon Heder, who made for himself a film career based on this performance alone. The character has a lot of amusing ticks and quirks, and while Napoleon would be fairly off-putting in person, Heder plays him as just vulnerable enough for him to not become a ridiculous, unrecognizably human character. Aaron Ruell similarly plays the wimpier older brother, Kip, to perfection, completely convinced in his own pasty, nerdy awesomeness. Jon Gries, as the disruptive Uncle Rico, rises to the occasion in the harder role of Uncle Rico, who easily could have gone off the deep end and become the film’s one true loathsome character, but just as soon as the film toys with the idea, it backs off, and though he’s still playing the film’s defacto lead “villain,” Uncle Rico remains within our good graces thanks to the Gries’ humorously damaged portrayal and the movie’s unwillingness to go too far in looking down upon its characters. Come to think of it, that’s probably why the film saw such great success – despite the silly humor and unusual characters, there’s a good-natured spirit just below the teasing humor that still admires its socially inept but genuine characters over the perky cheerleaders and jaded jocks who put up fronts and look down on them. The humor may be incredibly goofy and not exactly cerebral in nature, but I would hardly call the movie lazy or accuse it of going for cheap laughs – there’s still a lot of keenly observed character humor and even a lot of attention to detail in the backgrounds and costuming that will make you smile. People may have latched onto the easily remembered dialogue a bit too much these past ten years, but do yourself a favor and don’t let the overzealous fandom influence your perception of the movie itself, like I had done. Taken on its own merits, this is a reliable film that will be there when you’re in need of a good laugh.